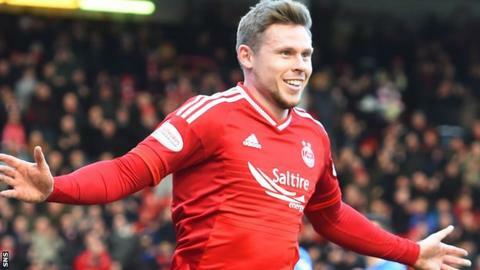 Aberdeen boss Derek McInnes has backed striker Simon Church to fill the void left by leading scorer Adam Rooney. Irishman Rooney, who has scored 19 goals this season, has been ruled out until mid-April with a thigh injury. "You either feel sorry for yourself and have a victim's mentality, thinking 'Poor us' or you see it as someone else's opportunity," McInnes said. "I'm delighted we've got Simon Church. He's got two goals in four games. If he can keep that up he'll be doing well." Saturday's 1-1 draw with St Johnstone, after Celtic drew at Hamilton the previous day, was the third time in recent months the Dons had passed up an opportunity to make ground on the champions. In late November Celtic drew 0-0 at home to Kilmarnock before Aberdeen drew 1-1 at Hamilton the following day, while after Celtic's 2-2 draw at Hearts on 27 December, Aberdeen were held to a 0-0 draw by Partick. But McInnes denies his men have a mental block to overcome in their challenge to Celtic, who have a six-point lead with 11 games left. "In terms of it being a mental thing, I think people look too much into that," he added. "There's no doubt it was a missed opportunity. That's why we're all frustrated. "But we've been on a good run and the players deserve credit for where we are. But we're always striving for more. "Of course we'd rather have Adam fit. There's not many teams - if any - who wouldn't want him in their side. "But we will have to deal with it, as we have before. We have to make sure that little things like injuries, pitches being poor or referees' decisions don't stop us doing what we want to do." Aberdeen opened the Premiership campaign with eight successive wins, and went a further 12 games unbeaten in the league from the start of November until their recent 3-1 defeat at Inverness Caley Thistle. Midfielder Kenny McLean insists "everyone has to step up and take a bit of responsibility" to provide the goals required in Rooney's absence. And the 24-year-old believes Wednesday's trip to face bottom side Dundee United at Tannadice can be the start of another long unbeaten run until the end of the season. "Dundee United have turned a bit of a corner and will be scrapping for everything and fighting for their lives," he said. "But we need to match that and show how much we want it too. We are confident we can go down there and get the three points. "There is still plenty to play for. The runs we have been on this season shows how well we can do. We know we can go from now until the end of the season and win the majority - if not all - of our games. That is the way we need to look at it."